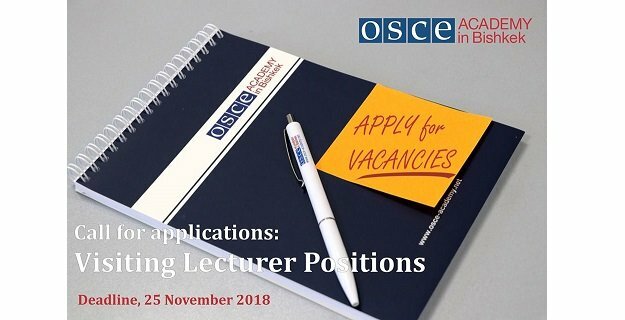 The OSCE Academy in Bishkek is a public foundation, created in 2002 between the Kyrgyz Government and the Organization for Security and Cooperation in Europe (OSCE). The OSCE Academy promotes principles and values of the OSCE through post-graduate education, professional trainings and intellectual exchange. Its highly demanding MA Programmes in the fields of “Economic Governance and Development” and “Politics and Security (Central Asia)” annually enrol up to 60 young professionals from Kyrgyzstan, Kazakhstan, Uzbekistan, Turkmenistan, Tajikistan, Afghanistan and Mongolia on a competitive basis. • German Language, 3 credits, two 90-minutes sessions per week, 11 weeks. • Thesis Seminar, 3 credits, two 90-minutes sessions per week, 11 weeks. • Office space and a computer, as well as access to all of the OSCE Academy’s facilities. NOTE: The Academy will not cover transport, accommodation, health insurance and expenses of family members. The Academy, however, assists with all issues related to travelling to Bishkek and finding housing in the city.